Visit the Twitter developer site - https://developer.twitter.com/en/apply-for-access - you will need to login to your Twitter account if not already logged in. Make sure the right Twitter account is listed and hit 'Continue'. Assuming you are running SupportPal for your business, select the 'I am requesting access for my organization' option. Fill in all the fields that appear as appropriate and hit 'Continue'. Please fill in the questions shown. The following is a template response, but you may need to adjust it based on your own requirements. We have installed the SupportPal (https://www.supportpal.com) software and would like to use its Twitter integration. The SupportPal software uses a periodic cron task to fetch Twitter mentions and direct messages from users to our Twitter account. These communications create a ticket in the software only visible to authenticated operators, and the operators can then reply to the ticket and it posts a tweet or direct message back to the user. Documentation for this integration can be found at the link below. 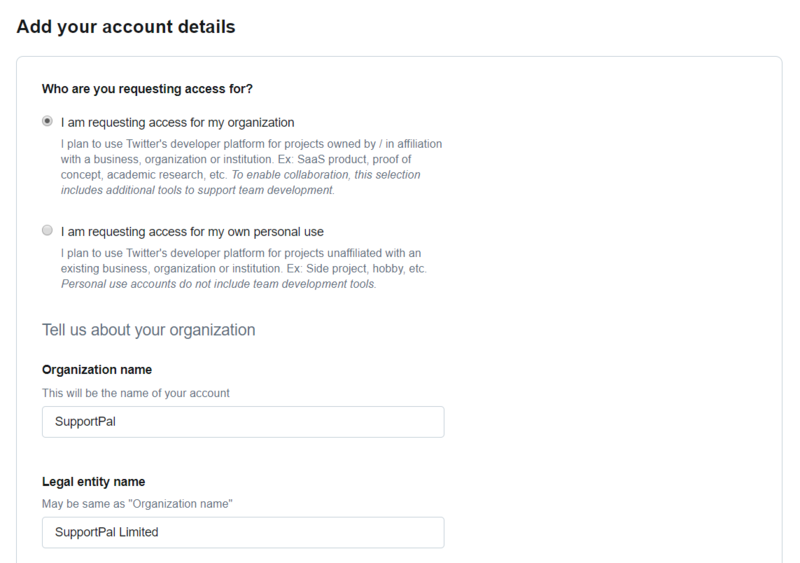 The software also provides an authentication option for Twitter, so users can register/login with their Twitter accounts in the software. Documentation for this integration can be found at the link below. Will your product, service, or analysis make Twitter content or derived information available to a government entity? Read through the terms of service and agree to it before submitting the application. Finally Twitter will send an email asking you to confirm your email address. Please click the link in the email and the application will then be in review. You will need to wait for Twitter to approve the application before creating your first application.